9000 people, as well as serve as a destination market for walkers and drivers alike. This market is designed to create a strong sense of community, and will help to sustain our local farming families and artists by providing a strong and direct market sales site. 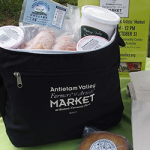 The market is sponsored and organized by the Antietam Valley Community Partnership, with support from the Antietam Valley Recreation & Community Center and the Mt. Penn Water Authority. Throughout the farmers’ market season, attendees will have the opportunity to buy nutritious, flavorful produce and homemade products, gather with friends and neighbors, enjoy our neighborhood park, and learn about the benefits of supporting local agriculture and the local economy. The market will take place rain or shine throughout the season. Use 905 Byram Street, 19606 as your GPS address for the market. The Antietam Valley Farmers’ & Artists’ Market is delighted to announce the start of the 2018 SUMMER MARKET season. The 2018 Summer Market season will be held May 12 through September 29, 2018. The market will consist of 21 dates, rain or shine. We have the option to be indoors in inclement weather if the Recreation Center is not previously reserved for an event. The AVFAM will be located in the heart of the Antietam Valley inside the Antietam Valley Recreation & Community Center, located at 905 Byram Street, Pennside, PA 19606. 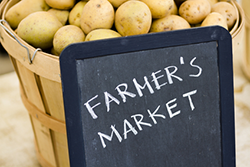 The market will open at 9 AM and close at 12 PM. This marks a new start time for our market! Directions to the market: Carsonia Park is located near 905 Byram St., Pennside, across from Anthony’s Trattoria. From 422, turn onto Rt. 562/St. Lawrence Ave, and then left onto Bingaman Street. Left on Harvey Street, and right onto Byram. Or turn onto Oley Turnpike Road from 422 just across from Rita’s Water Ice, left at the Arbor Inn, straight across 562, and follow directions above. Interested in being a 2018 Summer Market vendor? >> Click here for more information, Rules & Regulations, and Application forms. For any questions about the Antietam Valley Farmers’ and Artists’ Market, email farmersmarket@antietam valley.org or click here for more contact information. 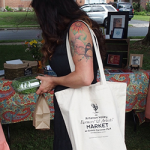 Remember to bring your own shopping bags to the market or purchase one or more of our beautiful one-of-a-kind market totes or cooler! 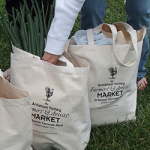 Stop by our AVCP Market Tent to purchase our beautiful canvas market tote bag with the signature market logo printed in black – these totes are sturdy and have practical, long handles so you can fill them to the top with market goodies and still have your arms free to carry more! Also available are cooler bags in black, with our logo printed in cream to complement our tote bag design. The cooler bags will be perfect for transporting meats, dairy, eggs, and other perishable items in the warmer days to come. Free ice pack with purchase while supplies last. Tote bags are $10; cooler bags are $15. The Antietam Valley Farmers’& Artists’ Market welcomes your four-legged friends, but please abide by our pooch policies to ensure the safety of our shoppers and vendors. All dogs must be kept on a short leash of no longer than four feet. 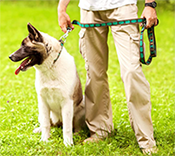 Retractable leashes must be locked at four feet or less. Keep your dog under control and by your side at all times. Please do not leave your dog unattended. Keep dogs away from produce, plants and other market products. Do not let your dog relieve itself within 50 feet of the market. And of course, please be prepared to clean up after your pet. 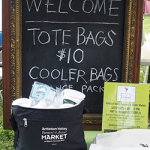 The Antietam Valley Farmers’ & Artisans’ Market wants to ensure the market is successful for everyone. If market volunteers feel a dog is being aggressive or endangering the safety of shoppers and vendors, they will ask the owner to remove the dog immediately from the market. Service dogs will be allowed at all times in the market, as required by law.